With a knife, cut the corned beef into 1-inch squares. If using thin deli slices, stack two layers of corned beef. To make the avocado shamrocks, slice an avocado in half lengthwise. Twist both halves to separate, and carefully remove the skin and pit. Slice each half of the avocado in thirds lengthwise to make planks. Use the daisy or shamrock cutter to cut out shamrocks. If cutting out daisies, use a sharp knife to trim triangles from the bottom of the daisy to create a stem. 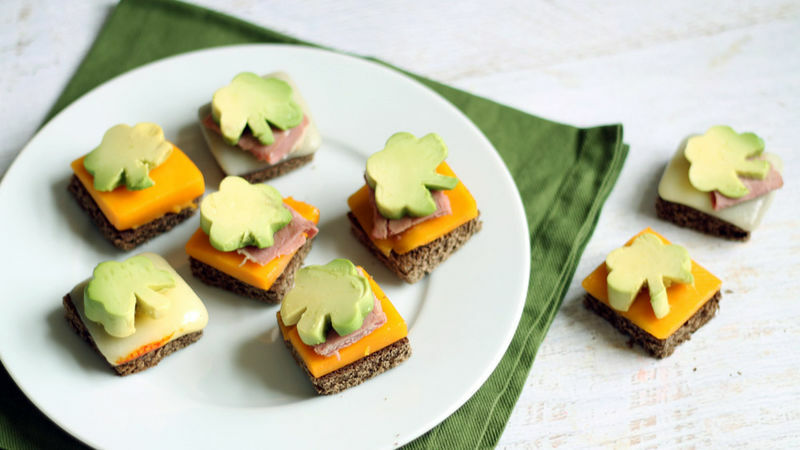 To arrange your bites, place a piece of corned beef on the melted cheese square and top with an avocado shamrock. This recipe also requires a 1 1/2-inch daisy or shamrock shaped cookie cutter or fondant cutter (or a sharp knife to cut your own shapes). Find the cutters in a craft or baking store. Vegetarian? Skip the corned beef! Your St. Patrick's Day party needs these. Seriously. So the avocado may not be native to Ireland, but you do need some nibbles to go with your Guinness™ this St. Patrick’s Day. And avocados are green and can be cut in the shape of a shamrock. Plus, the corned beef brings it all home. And you’ll get bonus points for using Irish cheddar, too. All of that is to say these are the perfect, party-stopping bites to serve for the Feast of St. Patrick. They're almost an entire meal in miniature: Squares of pumpernickel bread topped with melted cheese, corned beef and a bit of festive avocado. If you’re vegetarian, you can skip a bit of the Irish (the corned beef, that is). If you’re really feeling the Irish roots, make your own corned beef. Or just do what I did and get it from the deli. Cut the corned beef into one-inch squares using a knife. If your slices are thin, you may need to double them. Set these aside. To cut the bread and the cheese (tee hee), I used a 1 1/2-inch square cutter, which is actually a fondant cutter available in most craft stores. If you don’t have one or don’t want to buy one, just use a knife. Cut out squares from the pumpernickel. Cut out the same number of squares from slices of the cheddar and/or muenster cheeses. Place a cheese square on each bread square, then place on an oven-proof tray and broil on high just until the cheese is melted, about two to three minutes. Set aside. Make sure you choose avocados that are ripe, but still somewhat firm. Pick up the avocado and press it. It shouldn’t be so firm that it doesn’t budge. But it shouldn’t feel mushy behind the skin. It should give just a bit. You might get as many as 8 shamrocks per avocado if it's just at the right stage of ripe (where it’s easy to slice but holds its shape), but I suggest buying a couple extra to allow for error. If any part of the avocado is mushy, you won’t be cutting shamrocks from it. To slice the avocado, cut it in half lengthwise with a sharp knife, working around the pit. Hold a half in each hand, twist and pull apart. Gently remove the skin and the pit. Carefully slice each half in thirds lengthwise to get the most surface area. Cut out your shamrocks. I don’t have a shamrock cutter, so I used a 1 1/2-inch daisy cutter (also available in a craft store). I just used a knife to cut out the stem. To assemble the bites, place a piece of corned beef on the melted cheese and top with an avocado shamrock. And get ready to nibble!